When it comes to gluten free baked goods, it's the dense texture that makes them hard to digest. 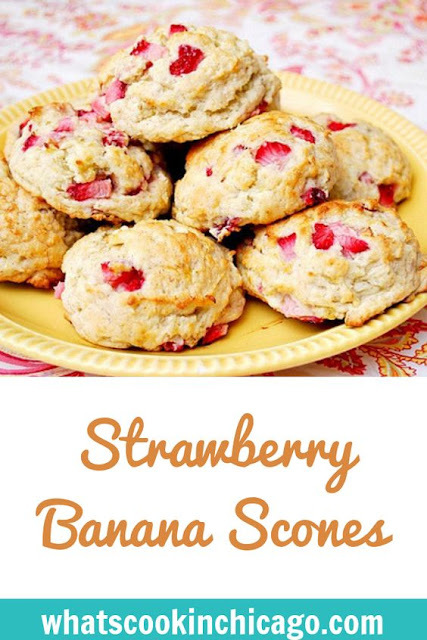 But I've found mashed bananas seemed to help keep GF treats moist, soft, flavorful and even a bit lighter.So when I wanted to make scones, I knew I needed to incorporate bananas somehow. With some fresh strawberries on hand, I decided to chop some up and add those to my dough. Since the dough was a bit tacky and sticky, forming them in the traditional round and cutting into wedges didn't seem like a good idea. So instead of wedges, I used an ice cream scoop and made scoops of dough for scones. In fact, the scones in the bakery case at work had the same shape so it isn't too far out of an idea. Overall, these came out wonderfully and freeze well too. It's a delicious way to use seasonal berries and the strawberry banana combination is always a tasty one! Beat egg and cream together in a two cup measuring cup. Add bananas to the egg and cream, and mash with a fork; set aside. In large mixing bowl, whisk the flour, sugar, baking powder and salt together. Add the butter and rub it into the flour until you have a pebbly mixture. Pour the egg, cream and banana mixture into the flour/butter mixture and stir to combine with a rubber spatula. Fold in strawberries. When the mixture is incorporated, using an ice cream scoop, scoop up scone dough and place 1-2 inches apart on the parchment-lined baking sheet. 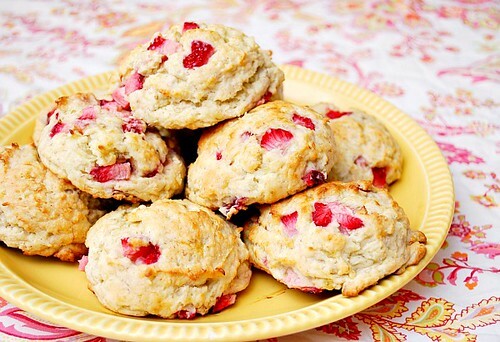 Bake the scones for 20-22 minutes, until the are nicely browned. Serve immediately. Store any leftovers in an airtight container. YUM! These look beautifully delicious!